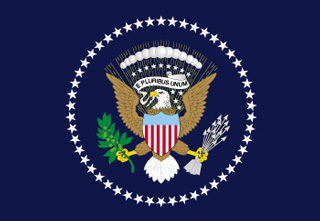 The Flag of the President of the United States consists of the Seal of the President on a dark blue background. It is displayed in the Oval Office and the buildings and vehicles when the Present is present, as well as in other military and ceremonial occasions. It is a symbol of the sovereignty of the nation and the executive power of the president. The flag was established in 1882 by the 21st president, Chester A. Arthur. He noticed that most of the kings and presidents of other countries had their own flag on the boats they were traveling, he initiated the establishment of a flag for the President of the United States. Thus, on August 9, 1882, the US Navy has issued the order that defines the flag of the President, and in 1883 it was first used on his trip to Florida. The design of the flag was changed several times, usually when the Great Seal of the United States was changed. The current design of the flag is defined by the Executive Order 10860 issued in 1960 by the President Dwight D. Eisenhower. As of today, in the next 4 years the flag will represent the 45th president, Donald J. Trump.